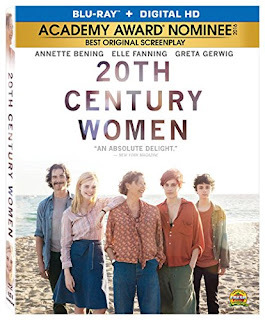 Nominated for an Oscar in the Best Original Screenplay category, 20th Century Women is an inter-generational coming-of-age tale set in Santa Barbara, California in 1979. The nostalgic ensemble drama revolves around the efforts of a neurotic single-mom (Annette Bening) to parent a naive 15 year-old (Lucas Jade Zumann) in dire need of a role model. The picture's protagonist is Dorothea Fields, a middle-aged chain-smoker who owns the dilapidated rooming house where the bulk of the story is set. Paradoxically, she recruits a couple of considerably-younger females, Abbie (Greta Gerwig) and Julie (Elle Fanning), to help with raising her son, Jamie, conveniently ignoring the availability of a pleasant and ostensibly-plausible father figure in her handyman, William (Billy Crudup). Consequently, tenant Abbie tries to indoctrinate the impressionable kid by having him read popular feminist manifestos like "Sisterhood Is Powerful." Meanwhile, worldly-wise Julie, 17, is happy to share a Platonic relationship with him. After all, they've known each other since they were little. The engaging ensemble drama intermittently resorts to voiceovered flashbacks to develop each of the lead characters' back stories. First, we hear Jamie ruminating about life with his mom. Then, it's her fretting about understanding him less and less every day. We later hear Abbie's concern about her cervical cancer scare, and Julie's resentment of her therapist mother's forcing her into group therapy sessions. When not engaging in personal reminiscences, 20th Century Women effectively transports the audience back to the late Seventies. For, besides resurrecting the era's fashions and decor, the action unfolds against a variety of painstakingly-recreated, period familiar backdrops. In addition, the film's score features an eclectic mix of musical artists ranging from Rudy Vallee to Louie Armstrong to David Bowie to The Talking Heads. Though there isn't much of a message to glean from this inappropriately-titled homage to the dawn of female empowerment, one can easily appreciate its vivid triptych of poignant personal portraits. Blu-ray Extras: Audio commentary with writer/director Mike Mills; The Making of 20th Century Women; and 20th Century Cast.